Hundreds of migrants feared dead in the Mediterranean as Europe’s migrant crisis gets only worse. What’s Driving Europe’s Migration Crisis? 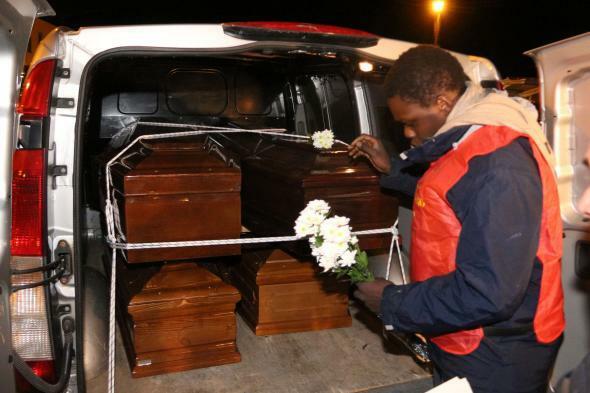 A man lays flowers on the coffins of immigrants who died trying to reach the Italian coast, on Feb. 11, 2015. In the sort of tragedy that’s becoming depressingly common in the Mediterranean, at least 300 migrants are feared to have drowned when their overcrowded dinghies overturned on the journey from Libya to Europe. The Mediterranean is by far the world’s deadliest crossing for migrants. According to the U.N. High Commissioner for Refugees, nearly 3,500 migrants were killed attempting to cross the sea in 2014. * After a similar tragedy in 2013 when 366 migrants, mainly from Eritrea and Somalia, were killed in a shipwreck off the island of Lampedusa, the Italian government—which has borne the brunt of the influx of immigrants—began a yearlong operation called Mare Nostrum to rescue migrants in international waters. That operation wound down last fall and was replaced by a more limited operation that rescued people within only 30 miles of the Italian coast. The latest tragedy will raise the question of whether the more ambitious rescue operation could have prevented the deaths and will further exacerbate the dispute between Northern and Southern European governments over how responsibility for dealing with the asylum seekers should be apportioned. Human rights groups have also criticized European governments for being more interested in repelling migrants than saving them. As with the immigration debate in the United States, the question of how to address the causes of migration is a tough one. The current migrant crisis began in the wake of the Arab Spring uprising in 2011, with Tunisians departing after the revolution and sub-Saharan African workers fleeing the unrest in Libya. But last year nearly half of the migrants to Europe came from just two countries: Syria and Eritrea. According to UNHCR, the number of Eritreans and Syrians arriving in Italy increased by 280 percent and 240 percent, respectively, in 2014 compared with 2013. The reason for the Syrian outmigration is pretty obvious and well-understood. The country’s civil war is placing an unprecedented strain on the world’s humanitarian resources. Eritrea gets a lot less attention. The U.N. estimates that about 4,000 people flee the East African country every month and about 300,000 have left since 2000, a significant number in a country of only 6 million people. Eritreans account for about 22 percent of those attempting to enter Europe by boat. Many Eritreans are fleeing the absurd and repressive conscription system imposed by Isaias Afwerki’s autocratic government. Military service is compulsory for all Eritreans, both men and women, and while the period of this conscription was once limited to 18 months, in recent years the conscription of many Eritreans as young as 15 has been extended for indefinite periods. One of every two Eritreans is currently living in barracks, working for low wages on “national service” projects—often on behalf of companies connected to the country’s rulers—in what human rights groups criticize as a form of forced labor. A number of countries in Europe recognize forced conscription as grounds for asylum status, though amid the growing influx and rising anti-immigrant sentiment, Switzerland, which has one of the largest Eritrean communities in Europe, closed itself off to migrants from the country last year. Eritrea, a small country and one of the world’s most politically isolated, doesn’t often make international headlines. But as the death toll in the Mediterranean mounts, it’s increasingly clear that its crisis is also the world’s. *Correction: This post originally misstated the estimated number of migrants who died while attempting to cross the Mediterranean in 2014. It is 3,500 not 35,000.